In 1905 Harry Brooks, an enterprising 12-year-old with a horse cart, started selling produce. With a family recipe for caramel he started making Caramel Apples -- and Barney and Jim sold those as well. In the 1950s Jimmy Davis was traveling the mountains of Peru. On the side of the road he saw a man selling chipped ice with sweet colored flavoring on it. They were obviously popular, and they sold well during the heat of the day. A few years in the U.S., a commercial ice chopper making “snow” was developed. Remembering the chipped-ice in Peru, Jim bought one machine. 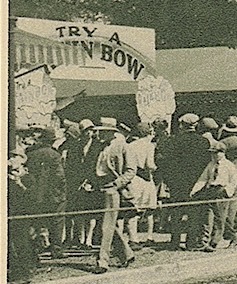 During the summer heat of the State Fair that first snow cone was a hit – first selling for 5¢. Over the years Barney & Jim tried new food items yearly. From the 1964 NY World’s Fair came “Belgium Waffles.” They even tried a round Ding-Dog in the 1950s. New novelties came and went, but the eternal taste treats are always: Rainbow Ice Cream, Sno Cones, and Caramel Apples.